Nevis Disaster Management Department (NDMD) / News / EUREC4A: What, Why, When, Where and How? EUREC4A: What, Why, When, Where and How? January 28, 2019 (Bridgetown, Barbados) – The first major planning and coordination meeting for the field campaign EUREC4A (Elucidating the Role of Clouds-Circulation Coupling in Climate) will be held at the Caribbean Institute for Meteorology and Hydrology (CIMH), Husbands, St. James, Barbados from 18-19 (TBC) February 2019. EUREC4A is a capstone field experiment of the World Climate Research Programme (WCRP) designed to significantly enhance scientific understanding of the role of Tradewind cumuli, which represent the most frequent cloud occurrence on Earth and commonly seen in the Caribbean, in controlling the magnitude and pace of future global warming. Data collected over the ocean east of Barbados during the field campaign will form the basis for significant improvements to our understanding of tropical meteorology. This understanding is expected to drive significant enhancements to the predictive capability of existing regional and global weather and climate models. Outputs from the field campaign and the models it helps inform will be important for disaster risk reduction and sector planning activities, both globally and especially across the Caribbean. Results from EUREC4A will inform investments for sustainable development and enhance long term climate resilience activities in key socio-economic sectors. and the international prominence of the Barbados Cloud Observatory, which has collected an extensive set of daily atmospheric measurements across multiple instrument platforms since its establishment in 2009 at Deebles Point located along the east coast of Barbados. The EUREC4A field campaign will include the deployment of at least two research aircraft [the German High Altitude and LOng Range Research Aircraft (HALO), a Gulfstream G550, and the ATR42 from the French Facility for Airborne Research (SAFIRE)), two to four research ships, advanced ground based remote sensing, a new generation of sophisticated satellite remote sensing and state-of-the-art turbulence-resolving computer modelling (with a resolution of a 100 m applied over thousands of km). The participation of additional aircraft and ships from the US and the UK is under discussion. The EUREC4A is designed to further benefit from data collected from ADM-Aeolus, one of the flagship satellite platforms of the European Space Agency Living Planet Programme. EUREC4A is also inspiring additional field experiments and partnerships that will be confirmed in the near future. These additional partnerships will bring additional state-of-the-art instrument platforms that will further enhance data collection. Dr Stevens points out that “Findings from EUREC4A are expected to make a central contribution to efforts to anticipate future global warming, and how this warming impacts quantities as diverse as the sea-level rise, changing patterns of precipitation, and the distribution of major wind systems. 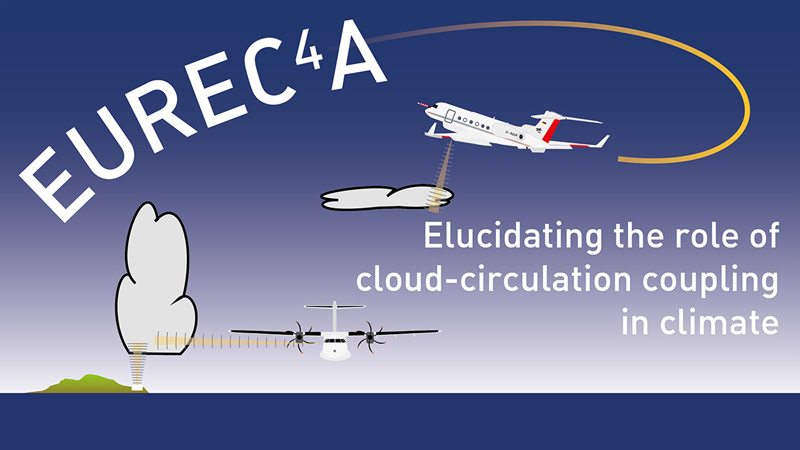 At the same time EUREC4A is opening new levels of inquiry into how the atmosphere and ocean communicate. Measurements made during the campaign, some of which will be made for the first time ever, will be influential for a new generation of scientists trying to also understand what governs ocean smallscale current systems and their effect on ocean biology and sea-grass, as well as factors influencing major forms of renewable energy, such as wind and solar. Dr. Bony, one of the scientific Pis of the EUREC4A field campaign, senior scientist of the French National Center for Scientific Research (CNRS) at the Laboratory of Dynamical Meteorology in Paris (France) and laureate of the European Research Council Advanced Grant EUREC4A, noted that “EUREC4A is a field project motivated by 15 years of research on the role of clouds in climate and climate change. Narrowing the uncertainty in global and regional projections of our future climate requires a better understanding of how clouds, and trade-cumuli in particular, will respond to their changing environment, and how this response will affect Earth’s temperature and circulation patterns.